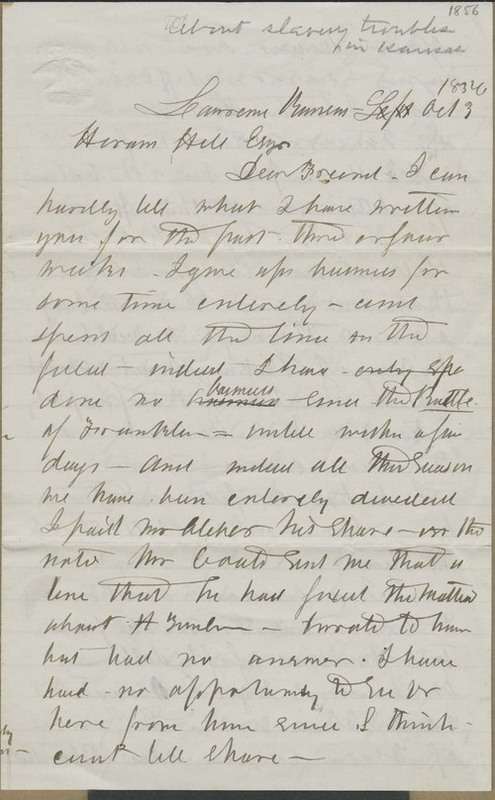 Samuel Simpson wrote from Lawrence, Kansas Territory to Hiram Hill, reporting that he had done no business since the Battle of Franklin, early the past June, until the last few days. Hill's homes were all paying rent, and Simpson was taking steps to get a road built through West Lawrence. Simpson had received money sent by Hill and passed it on to Osawatomie to help them recover from the battle of the previous August. He continued to hope for the election of Fremont, and described conditions in the military camps.